Some homeowners try to “save” on costs by choosing the cheapest decking option they can find. As most people know, cheap materials and cheap labor yield cheap results. If you want a well-built deck that will last for decades, you’ll need higher-quality materials and installation that can withstand a wide range of weather. Just like installing a new roof, installing a new deck is an important investment in your home. This means you need to know what you’re looking for in an investment and ask the questions you need to make sure your final choice aligns with these goals. Unfortunately, many home homeowners don’t do much due diligence prior to making their deck decisions. Don’t make this mistake! 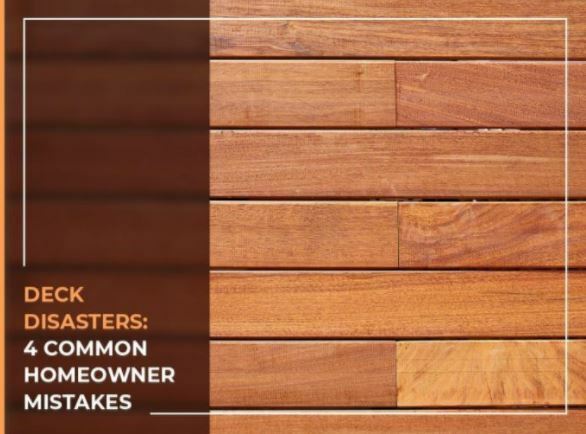 Ask your deck contractor for a list of materials being used, and expenses you should expect for installing your deck and for keeping it in great condition throughout its lifespan. And of course, be sure you get an expected date of completion and even proof of worker’s compensation and liability insurance. You’ll want the peace of mind that comes with knowing you’ve chosen a deck contractor that has all of their ducks in a row. A deck installation will project will require the homeowner to prep the area for the project. This means removing any grills, tables, chairs, plants or other decorative elements standing in the way of your new deck. This will make it easier for your deck contractor to begin the installation process and it will ensure that no inadvertent damage comes to your items. Homeowners who end up with the deck of their dreams can still experience unpleasant surprises if they’re not prepared to give their deck regular maintenance after installation. After all, without proper maintenance, your new deck could deteriorate far quicker than you expect. The good news is that there are a variety of composite deck materials that don’t just withstand a wide range of weather elements but they also offer the same beautiful look as pure-wood decks. Be sure to ask our deck contractors about the types of materials being used in your deck and what kind of maintenance is needed (or not needed) to keep it in great condition. Now that you know what to avoid, are you ready to add a deck to your home? State Roofing can help you out. We’re the leading provider of deck and roofing installation services in Seattle, WA area. Call us at (360) 205-3100 or fill out our contact form to request a free estimate.